TRANSACT 15, San Francisco – March 30, 2015 – Springboard Retail, a Cloud POS and retail management platform to help retailers sell more, and sell smarter, today announced the launch of its Channel Partner Program. Changes in payment and retail technology are driving market disruption and retailers are overwhelmed with options and unsure exactly where to turn. Springboard Retail empowers its partners to target local, regional and national retailers with a robust end-to-end cloud POS and retail management solution. Springboard Retail invites partners and retailers to join them at TRANSACT 15 in San Francisco today through Thursday April 2, in booth number 1902b, to learn more. Springboard Retail’s Partner Program provides its partners with the flexibility to choose the role they want to play in the market. 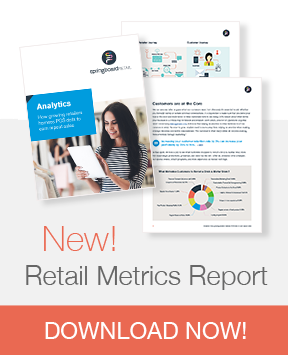 Springboard Retail Referral: The referral program is designed for companies looking to offer a more comprehensive in-store solution to extend the value they offer to retailers. Partners can bundle core services with Springboard Retail and displace legacy options by referring qualified leads to the Springboard Retail Customer Success Team. Springboard Retail Reseller: For partners in the business of selling and implementing solutions for multi-channel retailers, Springboard Retail is the perfect complimentary addition. Springboard Retail provides its partners the ability to break through the noise and offer a robust and cloud solution. Additionally, resellers can leverage Springboard Retail’s comprehensive REST API to build new applications and integrations that extend the value they offer their retail customers.